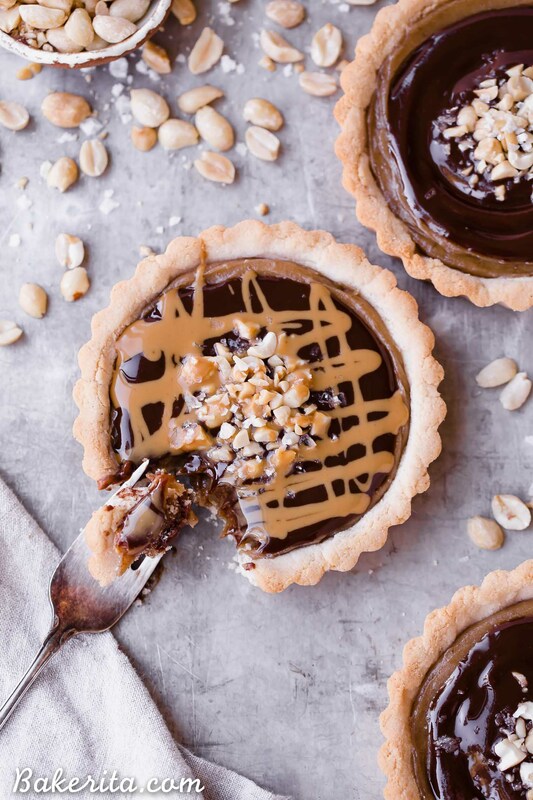 These Chocolate Peanut Butter Caramel Tarts have a crunchy shortbread crust that’s filled with a creamy peanut butter date caramel and topped with creamy chocolate ganache! This decadent tart recipe is gluten-free, grain-free and vegan. Except that I just discovered that today is NATIONAL PEANUT BUTTER DAY! And how could I not share a peanut butter recipe on what is debatably my favorite day of the year? I just had to. And if you had a bite of one of these tarts right now, you’d understand. They are chocolate peanut butter goodness to the MAX. This was one of those recipes that worked it’s way into my brain and demanded to be made IMMEDIATELY. Since I had all the ingredients on hand, it was. Although there’s a few different steps/layers to this recipe, they’re all suuuuper simple to make, and it shouldn’t take you any more than 20 minutes of active time to make this tart. Alright, so first up, let’s talk about the shortbread crust. It’s made with just coconut flour, maple syrup, coconut oil, and a pinch of salt – easy as that! I know someone will ask, so here’s the answer: since coconut flour is so uniquely absorbent, you can’t substitute in any other flours in place of it…it just won’t turn out the same. The peanut butter caramel is sweetened with DATES! This makes the caramel super thick and creamy and luscious, and it doesn’t have a super “datey” flavor or anything, just pure sweet goodness. The dates are blended into caramel bliss with some peanut butter, hot water, a little coconut oil, and a touch of salt. You can use more or less water to make it as thick as you like. 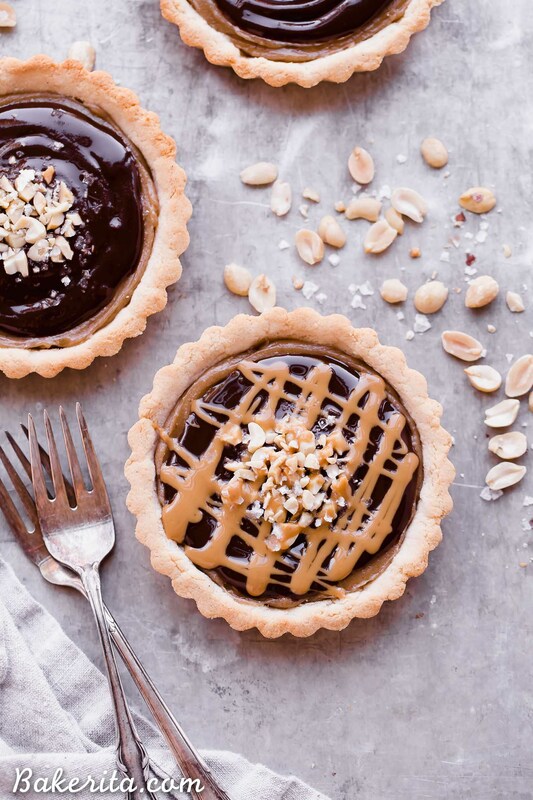 The peanut butter date caramel is spread into the crust and then topped with a SUPER easy chocolate ganache topping. It’s made super simply with cacao powder, maple syrup, coconut oil, and of course, a little peanut butter. 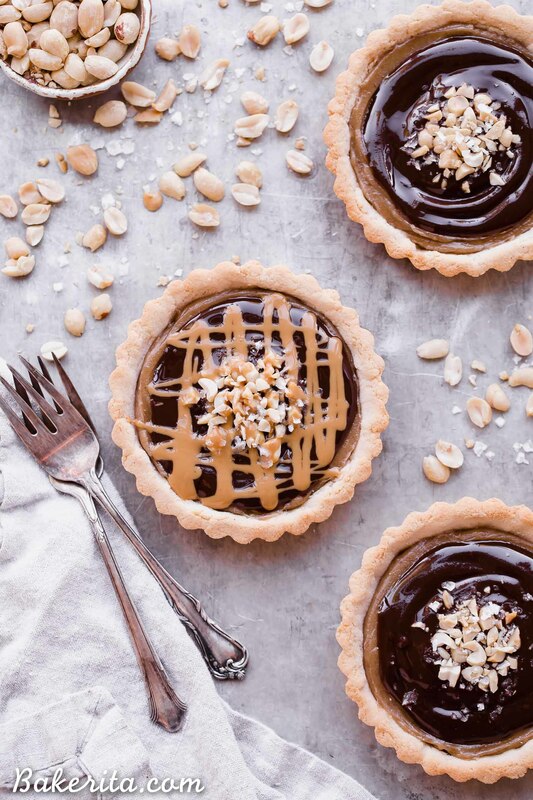 The whole tart is garnished with peanuts, flaky sea salt, and if you’d like, a little extra drizzle of peanut butter…because can you ever have too much?! 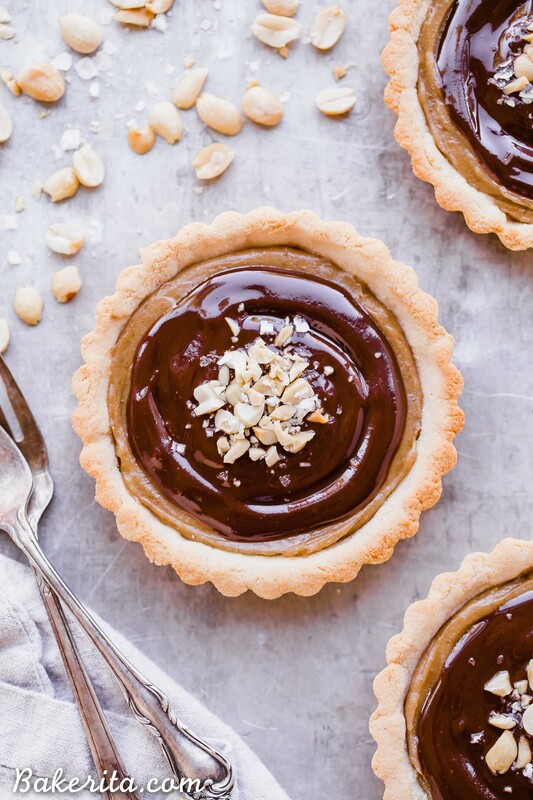 The resulting chocolate peanut butter caramel tart is creamy, sweet, salty, and nutty, with crunchy from the crust and with the lusciously smooth caramel and chocolate filling. I haven’t been able to stop breaking off pieces from the fridge to snack on, and a little piece is enough to satisfy because this chocolate peanut butter caramel tart recipe is rich! Share this with the chocolate peanut butter lovers in your life and they’ll love you forever. Enjoy! 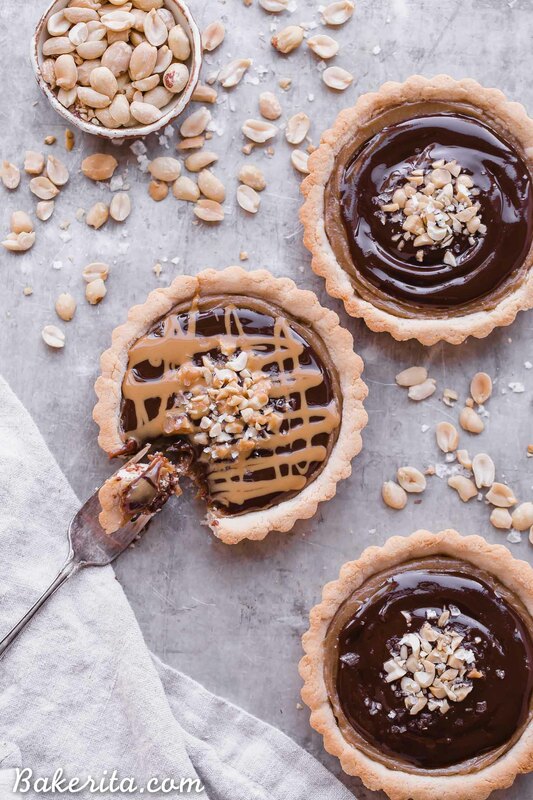 These Chocolate Peanut Butter Caramel Tarts have a crunchy shortbread crust that's filled with a creamy peanut butter date caramel and topped with creamy chocolate ganache! 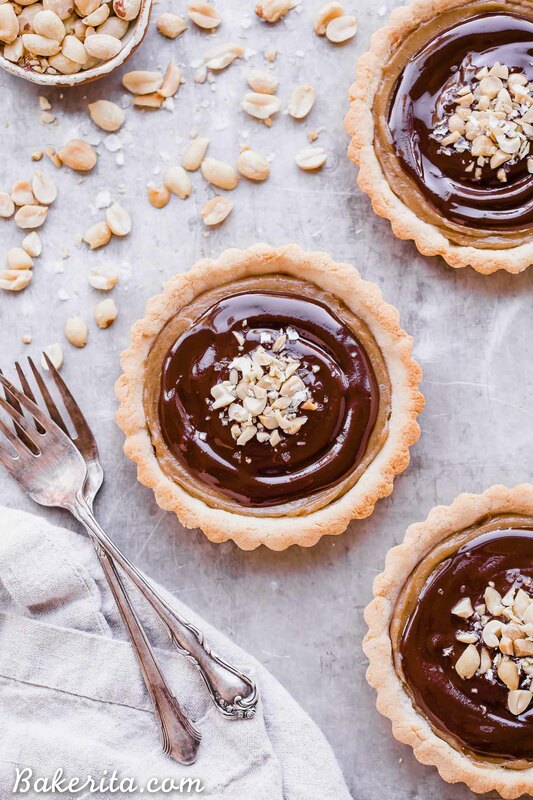 This decadent tart recipe is gluten-free, grain-free and vegan. Preheat the oven to 350ºF. Grease three 4” round tart pans with removable bottoms or an 8” round tart pan with a removable bottom or an 8x8” square pan with coconut oil (I recommend lining the pan with parchment paper as well if your pan doesn't have a removable bottom). Combine the maple syrup and coconut oil in a bowl and mush together, pressing out any of the clumps in the coconut oil. Stir in the coconut flour and kosher salt and stir until fully combined. Press the dough into the prepared pan/s. Bake for about 12 minutes for a larger pan, or about 8 minutes for smaller pans - the dough should be golden brown around the edges. Let cool completely. For the caramel, combine the dates (soaked if necessary) with the peanut butter, coconut oil, and ¼ cup hot water in a blender. Blend until completely smooth. Add extra hot water if it’s thicker than you’d like. Add a pinch of salt too if you used unsalted peanut butter. Spread the peanut butter caramel in the tart shell/s. For the chocolate topping, whisk together the maple syrup, melted coconut oil, cacao powder and peanut butter until smooth. Pour over the peanut butter caramel. Garnish with roasted peanuts, peanut butter, and flaky sea salt as desired. Return to the fridge to let the chocolate harden before serving, about an hour. Store tightly sealed in the refrigerator for up to 5 days (best for the first 3) or in the freezer for 6 months. Thanks for the love Kayle! Do you have any tips for making your tart crusts look so perfect? When I made these my crusts shrank and were super short.. yours look like they have a beautiful edge around them. Can you help?! Thanks! I make sure to press them up the sides nice and evenly! I like using a flat-bottomed measuring cup or something similar to press the bottom to an even layer and then to the sides to make sure they all have a nice edge. Hope this helps! Yes Carol, I agree – molasses wouldn’t be a great fit here since it’s not as sweet as maple syrup, with a much deeper flavor. Sorry you didn’t enjoy them!